You may have noticed that our campaign of the day segment got a little less daily sometime last week, and that is because we have decided to change up our format a bit. Instead of posting a campaign every weekday, I will give you 3-5 campaigns to follow every Tuesday, and follow up on their progress on Sunday. So let’s see what I have for you this week. 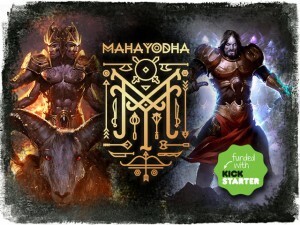 First up this week is Maha Yodha, a strategic card game featuring characters and weapons from ancient Hindu mythology. Maha Yodha features two factions – the Aditya and the Asura – as they battle for supremacy. The theme is one that has not often found its way into gaming, and one with a rich cultural heritage that is exciting to explore. On top of that, Maha Yodha has some of the most beautiful artwork I’ve seen in any game. The images are iconic, powerful, and dynamic. So beautiful. Should have sent a Vedic poet. Maha Yodha funded a while back, and has 10 days left to go. 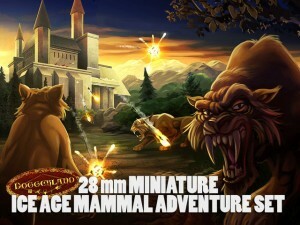 Currently, it is sitting on the cusp of its $25,000 stretch goal, which will allow the creators to include some new cards. A physical copy of the game is available when you pledge over $20, with print and play versions available at lower levels. 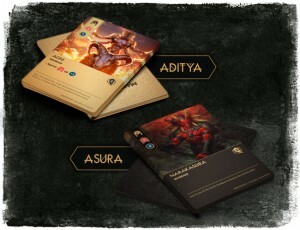 With interesting strategic play and amazing card art, Maha Yodha is definitely a campaign to watch. At $20 for a complete copy of the game, I would go so far as to say that Maha Yodha is almost certainly worth the money. If you have any interest in a two-player strategic card game, this is a campaign for you. Next up is God’s Gambit, another card game featuring deities vying for power. God’s Gambit centers around fallen gods trying to earn back their rightful place in the heavens by completing quests and doing good deeds. Each god has followers that can help them complete their quests, allowing the god to ascend. These followers can also be used to discard quests or present new challenges to rival gods, but doing so accumulates bad karma which can weigh heavily on the soul. 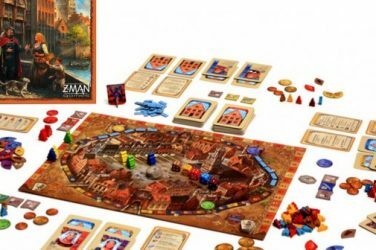 The game play is novel and interesting, and the art style – while familiar – is quite appealing. Sample artwork for a few of the cards. 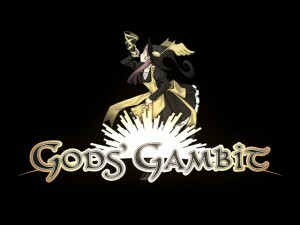 God’s Gambit has funded quickly, and this is no surprise – especially given that Seiji Kanai is attached to the project. Seiji Kanai, whose other projects include Love Letter, Cheaty Mages, and Chronicle, is one of the most consistently high quality game designers out there, and every indication is that God’s Gambit will live up to what we have come to expect from Mr.Kanai’s projects. While the base pledge of $40 seems a bit steep for a card game, the God’s Gambit promises to be worth it. On top of that, some of the more achievable stretch goals promise to add more cards to the game, improving the bang to buck ratio. As it is, this is definitely a campaign to watch. 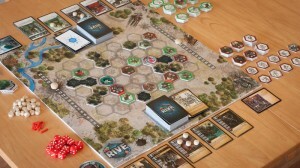 A hex-based strategy game with a deck designing element, Rive allows players 2-4 to choose one of the four factions to battle against each other. Rive is set apart from similar games by focusing more on how troops are initially deployed than on how troops move, which gives some familiar mechanics an interesting twist that keeps the game from feeling like just another hex game. The artwork is pretty typical, but the game is pretty attractive over all. An attractively familiar look for attractively unfamiliar gameplay. 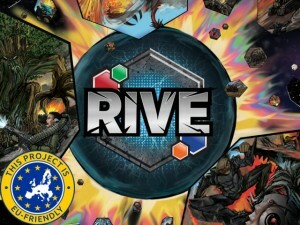 Rive has yet to meet its funding goal, which makes this a great time to jump in and fund it. The base funding level is $69 CAD, which is about $65 USD, which will get you a copy of the completed game – and seems about average for games of this kind. Rive is definitely a campaign to look at if you are interested in an interesting variation on hex-based strategy. We will post a full preview review of the game in the next few days to help you make up your mind about whether to back it, so keep an eye out for that. I’ve talked about ADW’s mini campaign before, and this campaign continues to be worth watching. This campaign has already reached over 2/3 of its funding goal, and has been one of the most actively evolving campaigns on Kickstarter. They continue to update their art and models, which look better all the time. In celebration of reaching their halfway point, ADW has decided to throw in an additional model (the Bullockornis) for free to all backers – and the concept sketch is pretty darn cool. 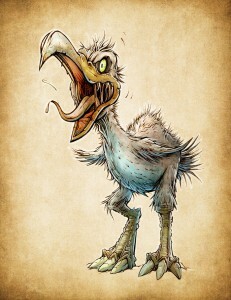 If it walks like a duck, and it quacks like a duck, you should run very, very far away.